Ok, I'm off to spend the day in Wenatchee hangin' with my fellow Copic peeps. Fun times! Ok, time for me to scoot. TTYL! push ups, drum sticks and dreamcicles. full of sticky quarters, dimes and nickles. run home and get your money before he's gone..."
Alrighty, thanks so much for stopping by. I'll catch ya later! Well, I hope your Tuesday is off to a great start. I'm hoping to be super productive around the house today... lots to cross off the ol' to-do list. Ok, well thanks for stopping by and I shall see ya manana! Who's ready for another glorious weekend? The forecast here calls for a slight cool down, only topping out in the high 70s over the next couple days. I'm ready for the break though, it will be nice being able to turn off the AC and enjoy the breeze blowing through the windows again. 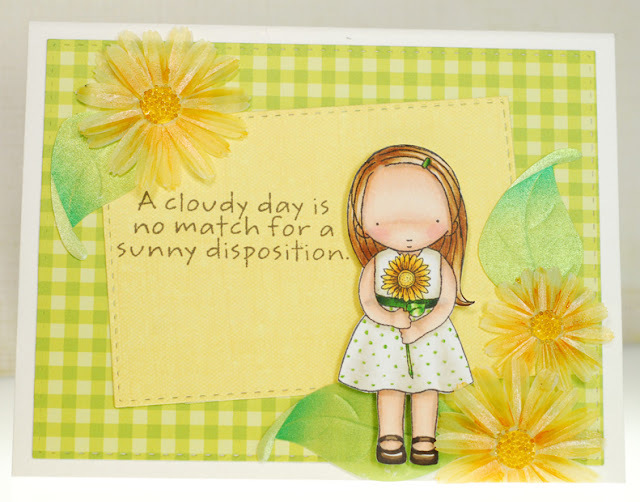 Today's card is all about sunshine however, so no cool down for this Gorjuss Girl. She's called Little Ducky and I got her from Sugar Nellie years ago. 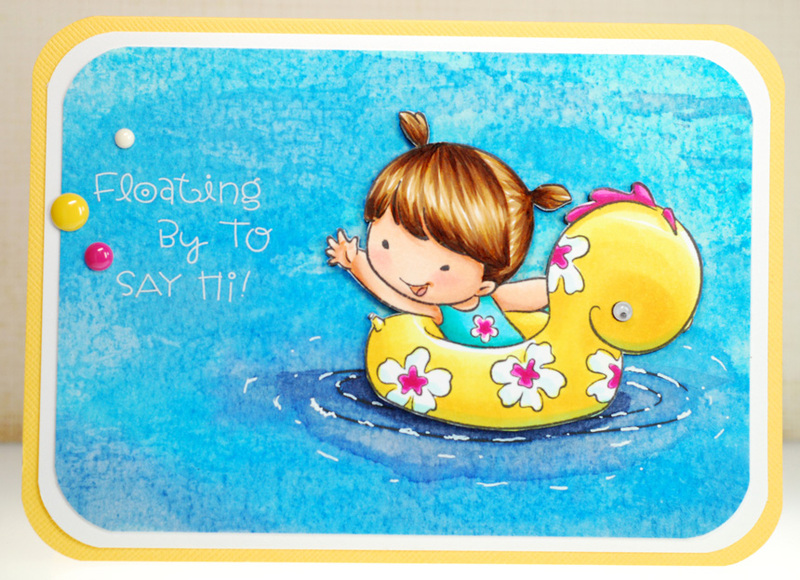 I'm not 100% sure if she has made it onto a card before now but I would like to think so because she is just too darn cute in those water wings! Paper wise I paired her up with some old KI Memories favorites and a new Bella Blvd favorite, surprisingly they coordinated quite well. 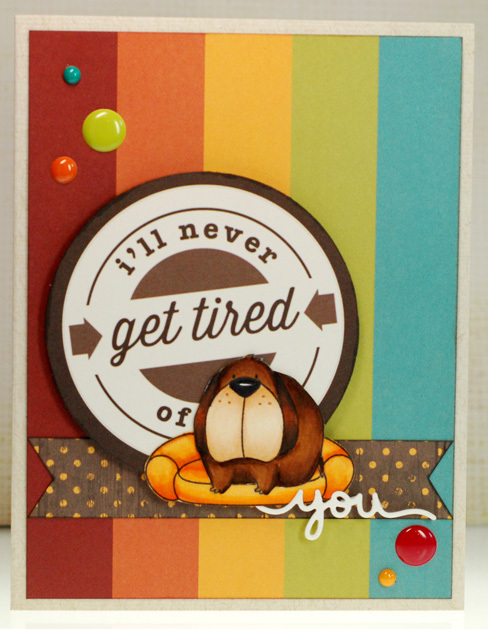 I am entering this card into the current 'Anything Goes' challenge over at the Sugar Bowl. Alrighty, have a great weekend everybody! OK, I'm outta here. Have a good one! Anywho, I couldn't find any water looking paper that I loved so I pulled out the watercolor paper and a whole slew of blue Distress Inks to create my own background for Kyana to float in. Once that was dry I used some old Doodlebug alpha rub ons to create my own sentiment since I didn't have a stamp that said what I wanted. 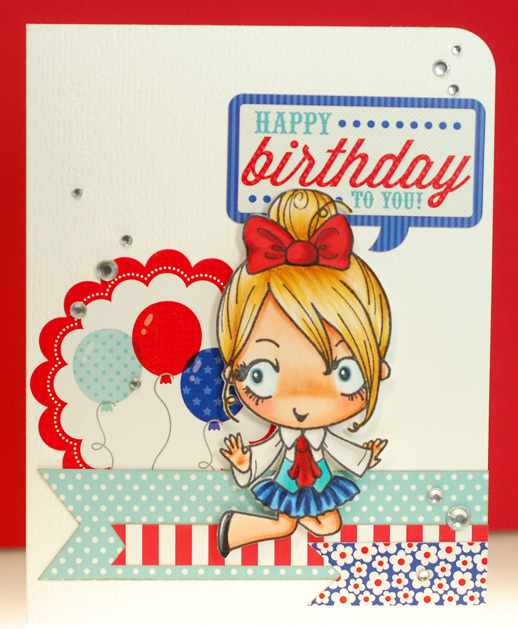 A small sprinkling of enamel dots and a googly eye on her floaty and I had a summer fun card all ready to go. This 'big head' digi from Some Odd Girl is called Ribbon and she must be retired now because I couldn't find her in the store anymore. I'm not sure why cause I think she is just lovely. She kinda reminds me of the nouveau girls that SOG did years ago which are still some of my all time fave SOG images. I paired Ribbon up with some old Basic Grey paper because it had the same dreamy quality that she has and the flowers are a really close match to the one in her hair. 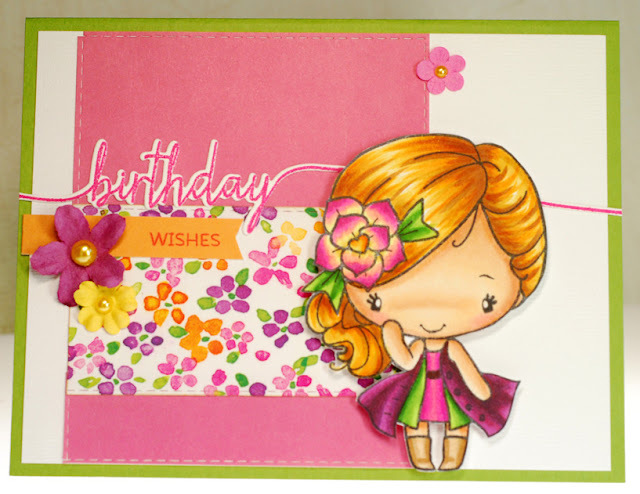 She is such a significant focal point that I didn't need to add too many embellishments, just a couple butterfly punches and some bling and this card was complete. Okey dokey, I'm outta here. Hope your weekend is fabulous and I shall see ya back here Monday! I slept in this morning so this post has got to be super quick! Alrighty friends, have a great day! My card today is a quickie featuring Pretty Kitty from Whipper Snapper Designs and a few accessory stamps from both Avery Elle and My Favorite Things. All of the stamps are on the smaller side, even Pretty Kitty, so I needed a way to give them more 'umph'. That is when I found this great sketchy dot paper in my stash and came up with the idea of using the dots kind of as a cubby hole to house each of the items. 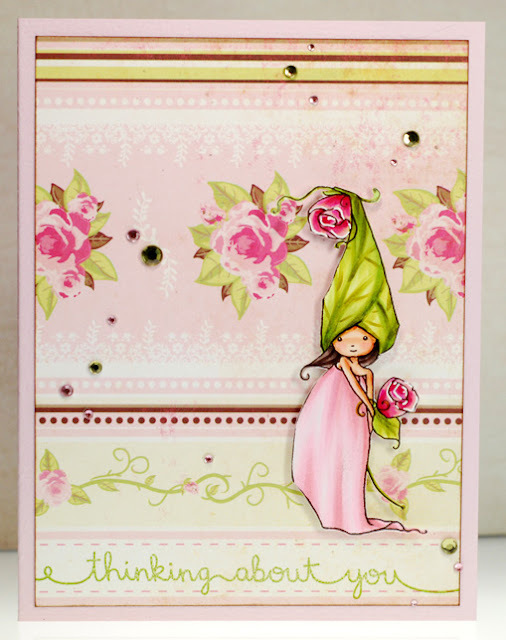 It makes for a very simple card but I love how it came together. Well thanks for stopping by... I'll talk at'cha later! Alrighty, well I am excited to say that I am off to enjoy a day of coloring and creating with a couple friends. I can't wait to get there and play! I got a couple new digi stamps from Some Odd Girl during their 4th of July sale and this sweet Tia and Puppy image was one of them. 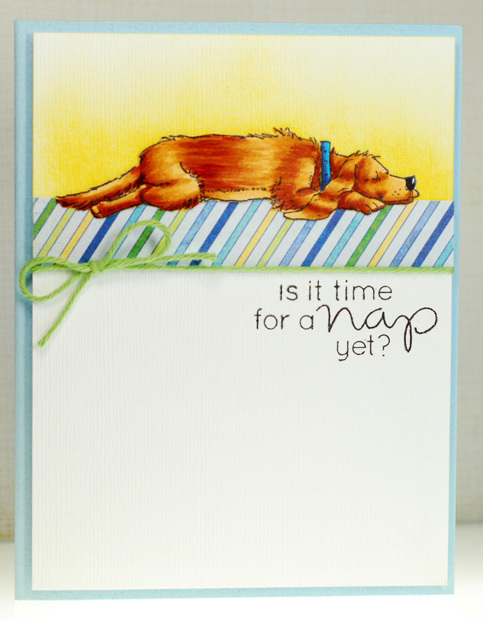 Ever since I began making cards for my sister's dog grooming shop I'm always on the look out for cute pet stamps and sentiments so it was nice to add her to my collection. 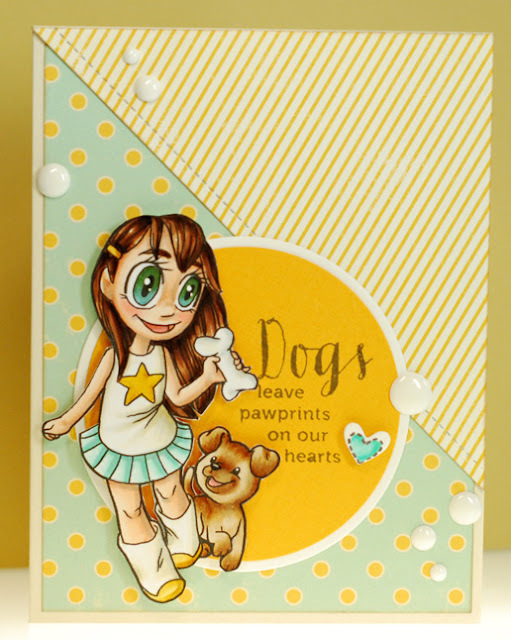 I paired Tia with a sentiment from the Simon Says Stamp Pawprints set and even though most of the sentiments are geared towards the loss of a pet I think this one can work for a more upbeat card as well. 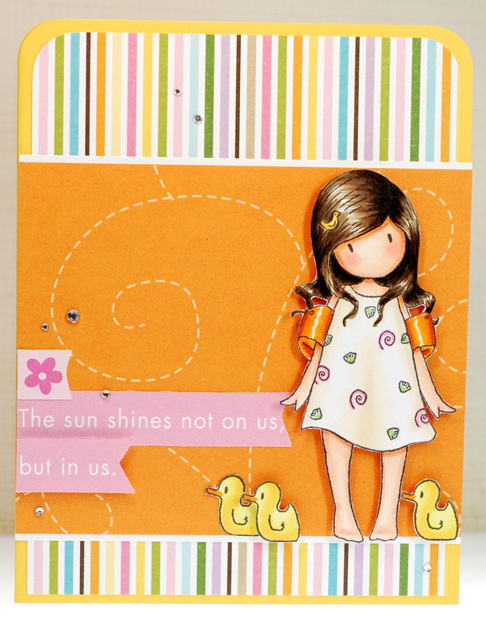 The papers are a mix of old October Afternoon that I pulled strictly for the aqua and yellow color scheme. I think it adds to the happy playful vibe I was going for. Alrighty folks, have a great weekend and I'll see ya Monday! 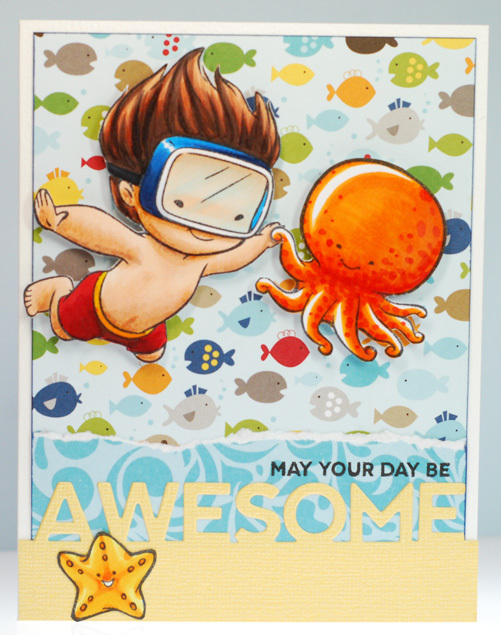 So my card for today features the underwater adventurer, Makai, and I was inspired by Jenny and her fab design team to pair him up with some critters from the previously released Octopus set. The sizing between the stamps is perfect. 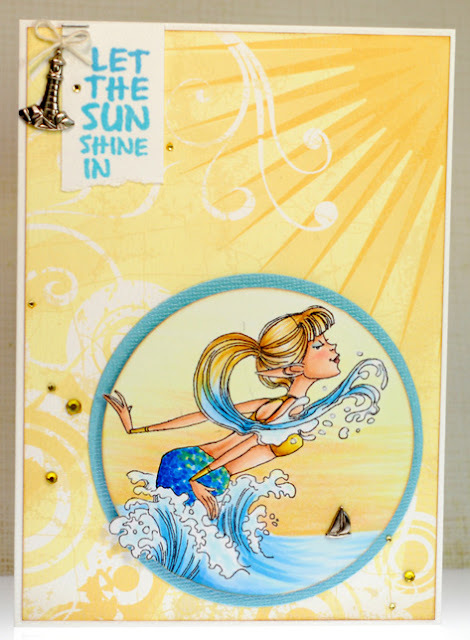 The papers are Bella Blvd's Camp Out collection, which I know I used recently with a mermaid but it was too great a background to pass up. And the sentiment was a no-brainer because how awesome would it be to glide through the sea, hand in tentacle, with a round little octopus?! 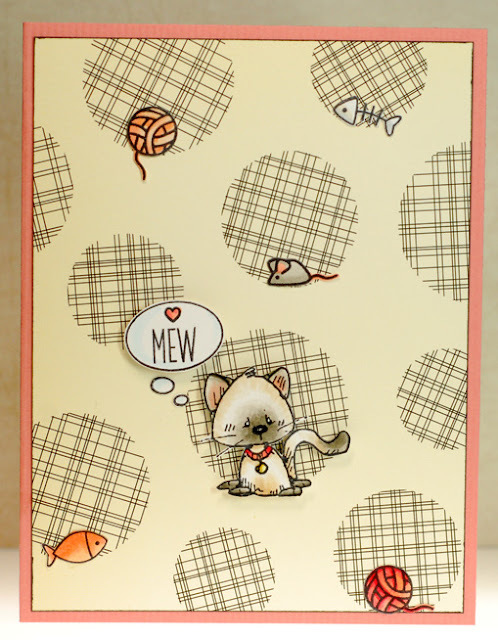 The yellow cardstock that the 'awesome' is cut out of looks off in this pic, in person it is a close match to the little yellow fish in the print. I suspect that the shimmery sheen it is coated with reflected too much light when I took the photo, but you'll just have to take my word for that. 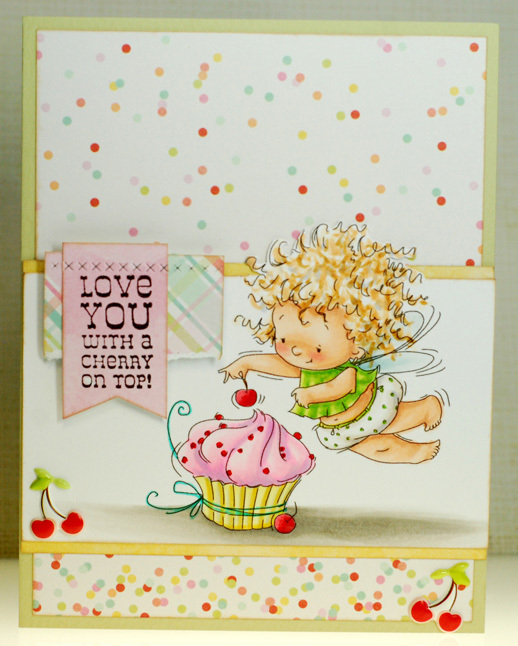 A few months ago I was lucky enough to be one of the winners at the Sugar Bowl challenge and this adorable Cherry Cupcake fairy was one of the digi stamps I had to use my gift certificate on. Isn't she just the cutest?! So it is only appropriate that I'm getting her on a card to enter the current SB challenge #126. I paired Cherry up with this great paper from Simple Stories that is actually one of their SNAP Packs which I think are made more for pocket scrapbooking but I love all the little bits of paper for my card making. 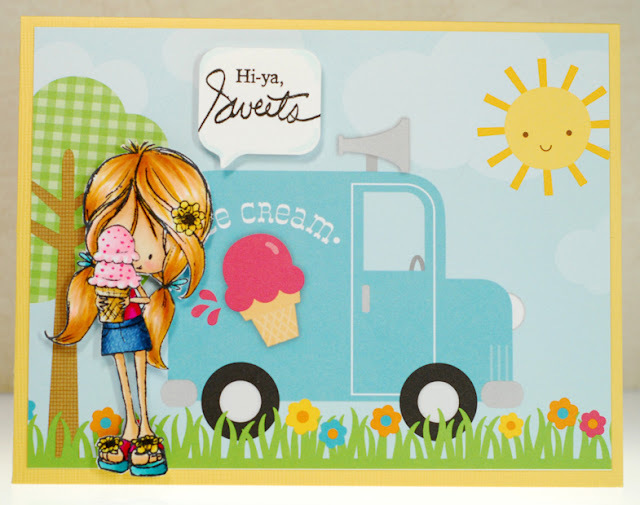 The colors and patterns came together to create a fun and festive summertime celebration type vibe so I also stamped 'Happy Birthday' on the inside of the card. Wow, what a weekend! It was such a great celebration this year, the weather was hot, the water was cold and the bar-b-que was delish! Nothing but relaxing and good times I tell ya. Now its Monday though and time to get back to reality I guess. Ok, I really need to get a move on this morning. Some of the first rubber character stamps that I purchased way back when I got started with Copics where from Stamping Bella. I love the Ketto collection they used to have and I own nearly all of them I'm sure. But it has been a while since I've added new stamps to my Stamping Bella binder... until now. 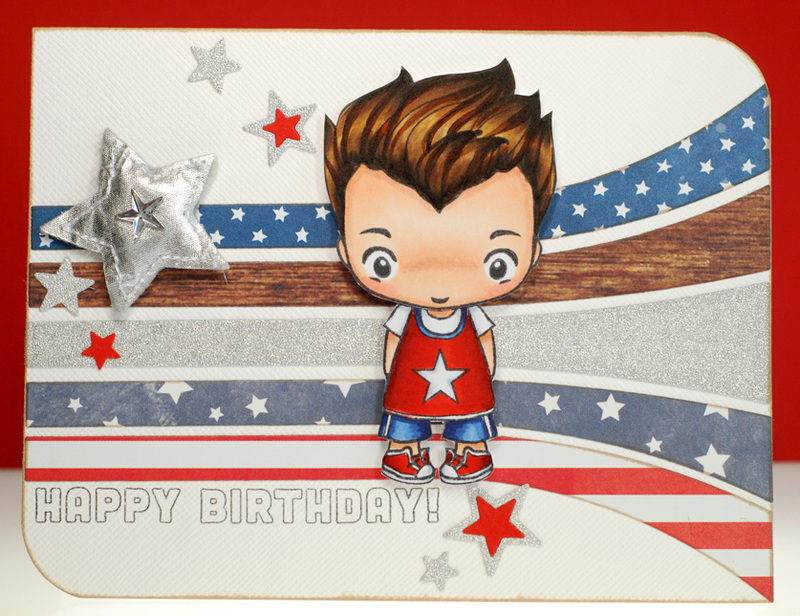 Their newest release of Tiny Townies swept me off my feet and also had me taking a second look at a few older Uptown Girl images as well. 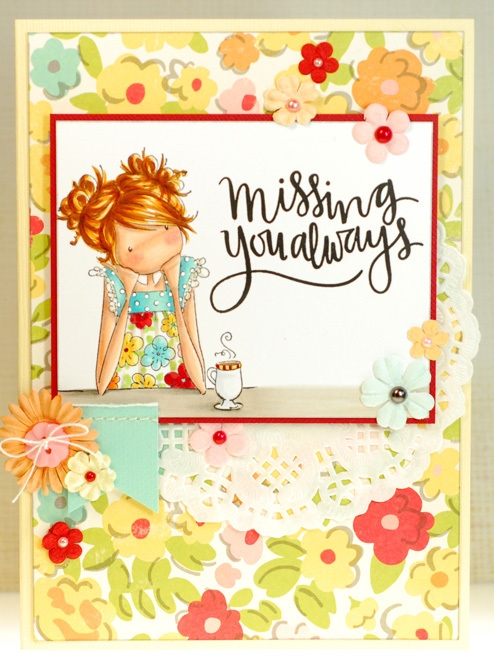 Jayden Loves to Journal is one of the stamps that recently fell into my shopping cart and while I adore the stamp as-is, I also saw her just dreaming the day away perfect for a 'missing you' type card. So I wiped the pen out of her hand and the journal off the table before stamping Jayden onto the cardstock, leaving her alone with her thoughts and a cup of tea. 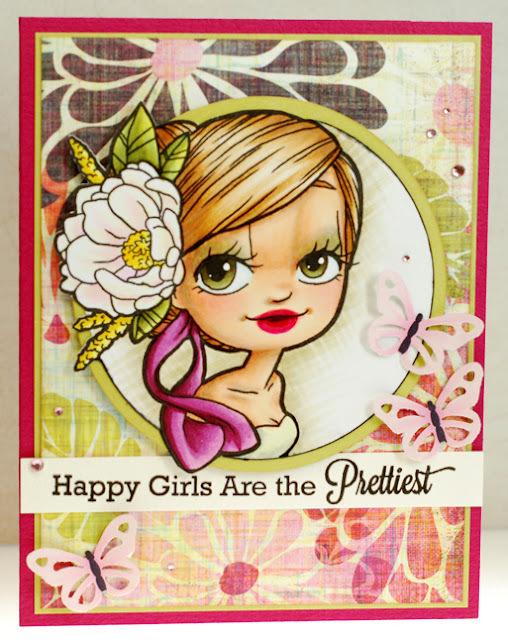 The flowers on her shirt had me pulling this new paper from the October Afternoon Summertime collection, I mean come on... talk about a perfect match, LOL! It seems to me that kittens are a pretty far departure from the mermaids that have been making their homes here this past month. I know none of my own cats want anything to do with the water, LOL! 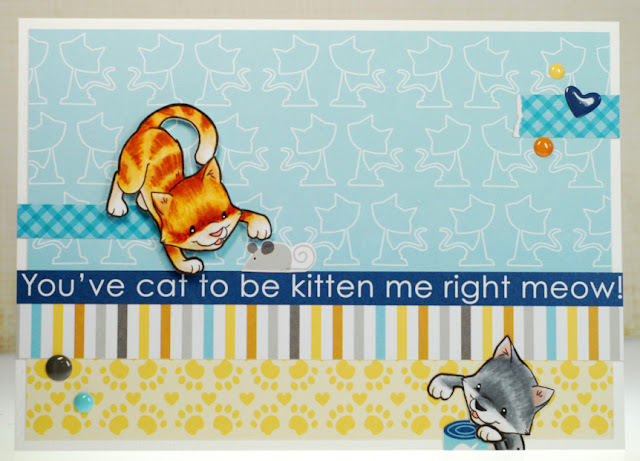 But I've had these digi images printed and ready to go so when I got some new kitty paper from Bella Blvd I knew this was the time to put them together. The stamp is called Kitty Hopper from Some Odd Girl and I printed it out twice mirroring it on the one so that they faced opposite directions. I ended up trimming one apart and drawing in a new back and leg so that it looks like it is peeking into frame, trying to get a hold of some Fancy Feast. The sentiment came right from the paper and I think adding 'congratulations' to the inside of the card will be a nice fit. Alrighty, I've got to scoot.